Fashion and Textiles is an intricate part of our society today. the Nigerian fashion and textile scene is one of the visible and booming arts today. Textiles are associated with life’s moments and festivals such as weddings, funerals, life cycles and many more. The Nigerian textile practice is divided into 4 parts according to Pat Oyelola’s book “Nigerian Artistry’, namely Pattern Dyeing, Weaving, Embroidery, and Appliqué. In pattern dyeing, we have Adire and Ukara. 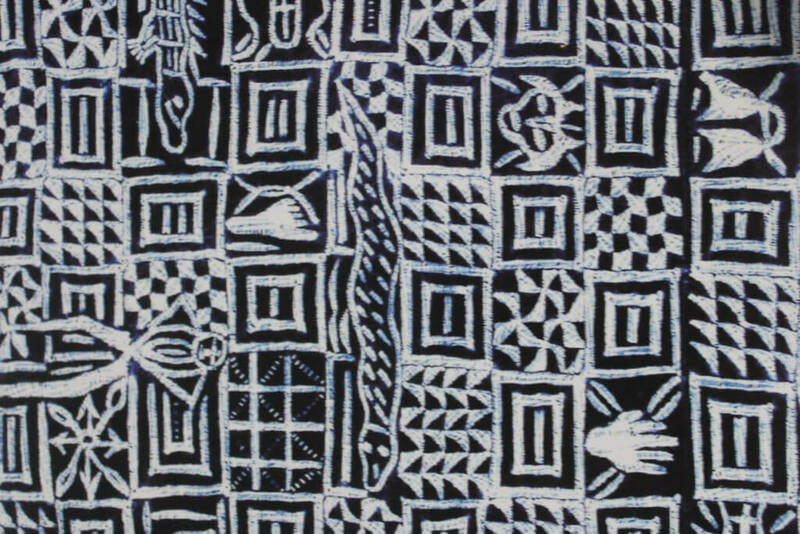 Adire is an Indigo tie and dye patterned cloth, which is done by resist techniques such as cassava paste and wax batik. This textile art is was founded by the Yorubas. 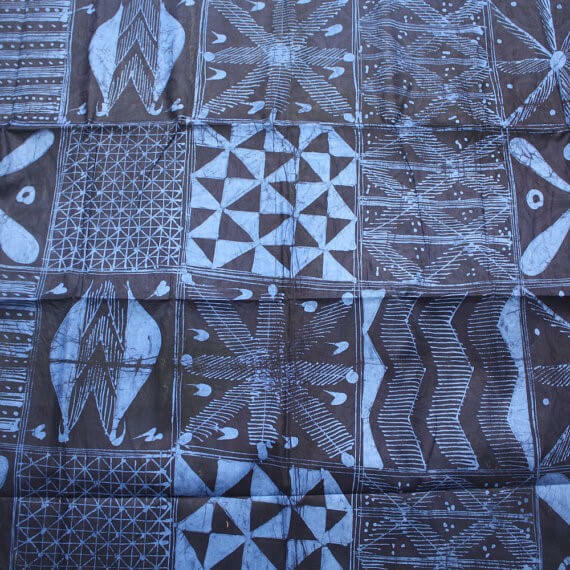 There are 3 different resist techniques namely, Adire Oniko (the use of raffia, which is tied to the both to create patterns), Adire Alabere (the use of needle and raffia to see the patterns onto the cloth) and Adire Eleko (the use of cassava paste to create patterns on the cloth). After Nigeria’s Independence Adire was developed in different directions but the old Adire cloths, Eleko to be exact was named according to the patterns on them. 3 particular designs stood out which are Ibadan Dun (Ibandan is Pleasant), Sun Bebe (Lift your waist beads) and Eyepe( The birds are assembled here). The common denominator in these designs is that the patterns drawn on them are divided into squares. Eyepe for instance, the cloth is divided into squares and each square was filled with stylized birds, fish, and lizards. Up until 1960, Adire was associated with Indigo and for the most part, it still is but the introduction of other coloured dyes and faster methods of applying patterns such as wood stamps and others led to new developments. Ukara is a special indigo dyed cloth from Imo state Nigeria. According to the book Nigerian Artistry, it is made in the Arochukwu area for the Ekpe (Leopard) Society. It is worn during meetings by new initiates and has a variety of patterns/motifs on it such as cluttered triangles, stylised dancing figures, lizards and many more. What distinguishes the Ukara from Adire is the fact that Adire is mainly indigo, indigo cloth with a slightly lighter shade of indigo for the patterns as well, while Ukara is Indigo cloth with white patterns and motifs. It is hard to determine how long woven cloth has been in existence in Nigeria but bronze figures from Ife depict people wearing cloth wrappers. These figures are as old as 900AD, which means that cloth could be as old as that. In weaving, we have Aso Oke of the Yorubas, Akwete of Abia, Aniocha of Delta and Hausa men weavers. There are two major looms used in Nigeria, the horizontal and vertical. Men use the horizontal while women use the vertical. For Aso Oke, this design is known for its use of colour, pattern, and texture. Colours were used and determined according to the climate. Men at a time (and till date) prefer beige, wine red, and indigo. Women, on the other hand, have always used brighter colours. Patterns have always involved geometrical shapes and figures and the textures are made according to the threads used, threads such as cotton and rayon silk. The akwete cloth is named after the women of acquit. Its made of cotton thread and decorative elements are made with heavier cotton thread or rayon silk. It is said according to the book Nigerian Artistry that certain motifs were revealed to women by the gods and when this happened no one was allowed to copy the designs. This meant that a lot of patterns and motifs died with the owner. Anocha weavers are conservative in their works as their textiles are white, with different patterns and motifs intricately woven into it. The patterns are brocaded but also have patterns derived from their environments such as kitchen utensils and what not. The White yarn and cloth symbolize Peace and Purity. It is used at functions such as weddings and funerals. The Hausa men weavers are known for their caps for men and the wrappers for women. Geometric shapes and patterns are used. This is the use of thread to apply designs and decorations to the surface of fabrics. The oldest form of embroidery in Nigeria is found in the North. The introduction of Islam brought in embroidery designs on cloth such as Alkyabba, which is still worn by Emirs today. 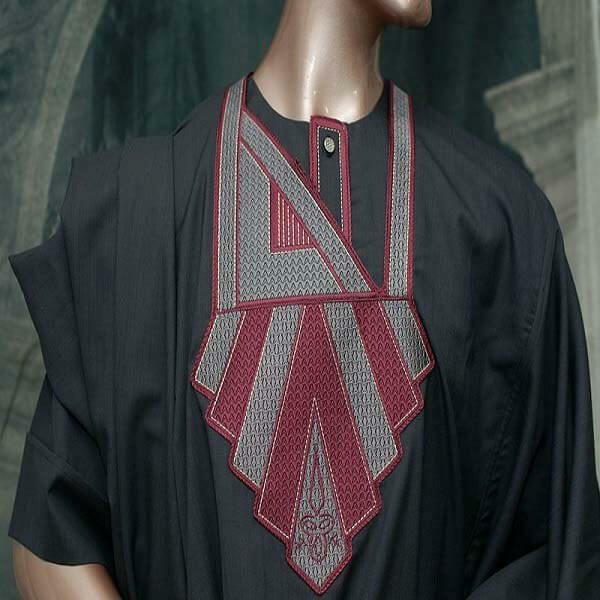 Embroidery is used in caps and men’s robes in the North but has made way to other parts of Nigeria where it is adopted by both male and female clothes. Blouses and Bubu’s and Abada’s (Male attire popular with the Yoruba’s(are embroidered with decorative elements and motifs. Embroidery is also used on ecclesiastical outfits. This is age art of cutting shapes from different fabrics and forming something new. This started in Benin republic but Nigeria is used in Nigeria as well. Appliqué is used in many parts of Nigeria and for different purposes. In Anambra it is used for the costume of the Ijele masquerade, The Yoruba used it for the Egungun masquerade figure, the Annang and Ibibio people use it make funeral banners and Durbar festival held in Kaduna use it for their tunics and well as the drawings for their horses. Textile design has a long and extended history in Nigeria and Africa. For more in-depth information, Nigerian Artistry by Pat Oyelola is a good place to start.